Since much of New York State’s coast is highly developed and populated, it is important to understand and plan for projected increases in sea level. Tidally influenced areas in New York State have experienced at least a foot of sea level rise since 1900. State projections estimate that sea levels will increase between 0.5 to 2 feet by 2050. NYSERDA has developed data resources for a range of future coastal flooding conditions in order to improve the ability of local and state officials, and others to assess vulnerability and inform resiliency planning. The table below provides estimated sea level rise projections by decade under low, median, and high scenarios and are representative of sea level rise projections found in the 2014 Supplement to the ClimAID Integrated Assessment for Effective Climate Change Adaptation. 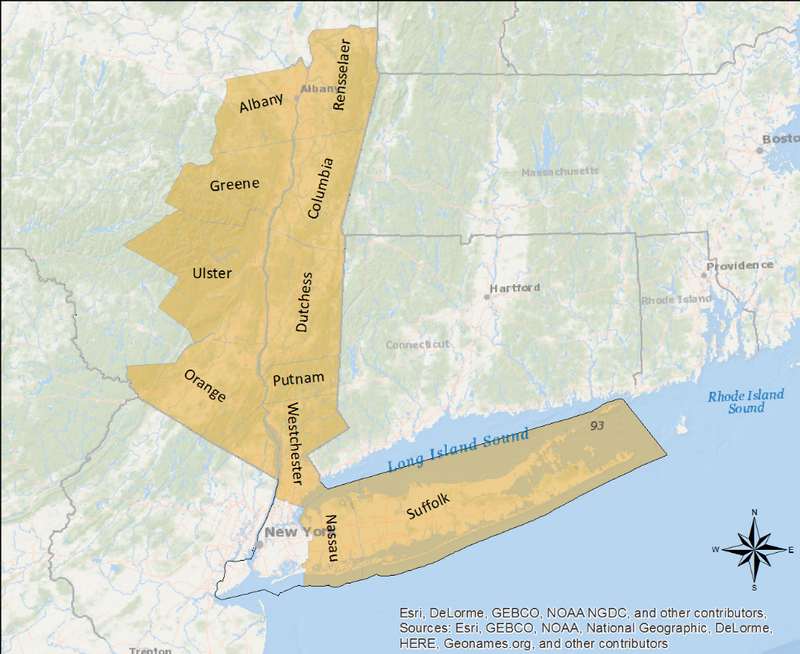 The Coastal New York Future Floodplain Mapper provides information for seven of these scenarios (12, 18, 24, 36, 48, 60, and 72 inches). Future Coastal Floodplain Extents and Summaries: These map layers show the extent of coastal flooding for the 10-, 50-, 100-, and 500-yr flood events (i.e., flood recurrence interval) for each sea level rise scenario. Community- and county-based summaries of the changes in flood extent for each scenario and coastal flood recurrence interval are also provided. Notes on tidal flooding: The Mapper provides a description of projected future flooding due to coastal storm surge and sea level rise. Users interested in map data describing future permanent inundation and/or tidal flooding under sea level rise without storm surge should refer to other available sea level rise viewers. Extent of Structurally Damaging Wave Action: Depicts the areas that have potential for breaking wave heights over 1.5 ft, for the 100-year recurrence interval under each sea level rise scenario. Structures subject to these wave conditions are likely to experience structural damage in the case of a 100-yr recurrence interval event. Areas within this shaded zone correspond to the Area of Moderate Wave Action, or the Coastal High Hazard Zone (VE) as defined by FEMA. This extent corresponds with the “coastal risk management zone” as identified in the New York State Sea Level Rise Task Force Report. Chance of Flooding: The percent chance of flooding over a 30-year timeframe for the selected scenario. Provided values are averages for the chosen community/county. The presented value reflects change in flood probability based solely on the increase in flood depth due to each sea level rise scenario. For more information on how the data was created, please contact NYSERDA.